NAME: If you are choosing to have your sign personalized, please enter the name below. If no name is left, we will not add a name to the sign. Thank you! We offer **FREE Personalization**. There are two font choices for the name, please see the pictures for an example with the "Jack" in the print font or "Olivia" in the script font. If you would like us to add your child's name, please leave a Note to the Seller at checkout. If there is no Note to Seller this item will ship without personalization. Choosing "Yes" to the personalization drop down menu and not leaving the name will delay your order. If you want to use this sign for multiple children, you may prefer the sign without the free personalization. 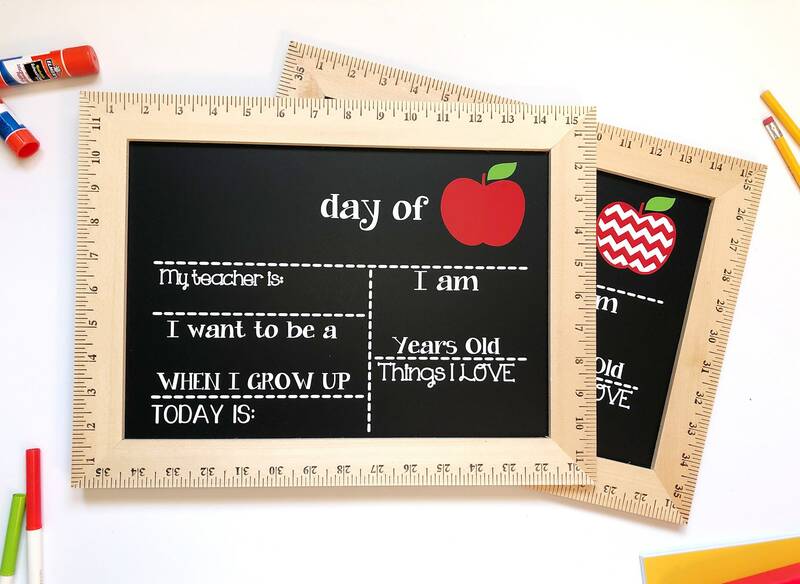 This chalkboard is the perfect size at approximately 11.75" x 15.5" with a wooden ruler frame, and is ideal to show how your little one grows. It is handmade in the USA and due to the nature of handmade items varies slightly from board to board. The wooden rulers feature variations in the wood grain that may result in darker sections, or lines in the wood. This is part of the charm of using real wood, and is to be expected. The chalkboard is high quality and made to last, so you can use it year after year. 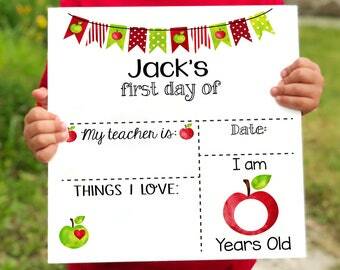 It has high quality permanent adhesive vinyl decals that allow you to fill in information about your child. 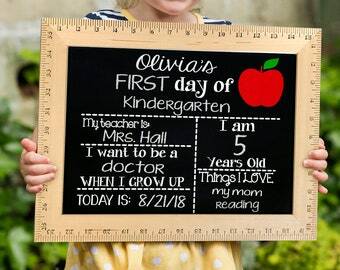 The back to school sign has your choice of a stylish Chevron Apple, Solid Red Apple, or Pencil. Use and Care: Our chalkboards work with regular chalk and most chalk markers. 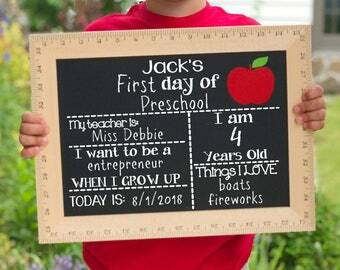 Please clean the chalkboard immediately after use to prevent staining. 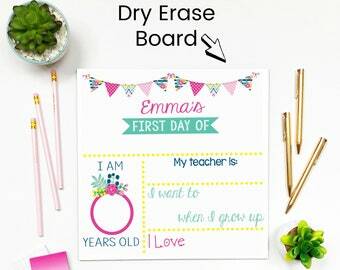 To erase, wipe the chalkboard clean with a damp cloth and have the board ready for next year. Amazing quality and such a cute item! The ruler border is beyond adorable. Durable and sturdy. Should last us many years. Easy communication with the seller. No issues. I do not accept returns or exchanges, but please don't hesitate to reach out if you have a question or concern about your order. I will work with you to find a resolution that will make you happy.